Fusing past and present style influences with incredible success, the Grafton Stool Walnut & Black is guaranteed to stand out from the crowd. Not to be missed, the Grafton Stool is sure to enhance your kitchen island or breakfast bar area with modern panache. 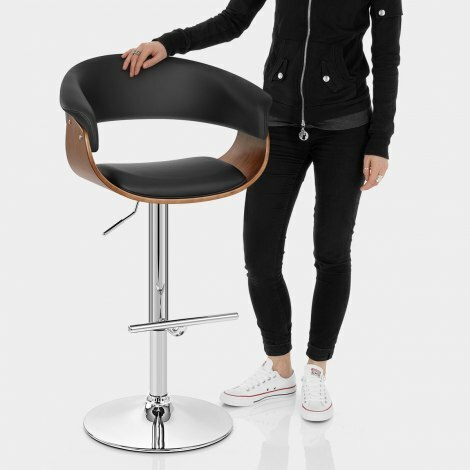 Possessing a rich walnut finish, the beautiful wooden seat is crafted from a single piece of bentwood that contrasts against the black faux leather seat cushion. Matching upholstery can be found on the comfortably padded backrest, extending into two armrests for added support. Cool and contemporary, the mirrored chrome frame enables optimum mobility thanks to a gas lift mechanism for variable height and 360 swivel. A T-bar footrest makes for another chic yet practical feature, whilst a protective underside beneath the round chrome base helps minimise damage to flooring. "They are solidly built and very easily constructed"
We are delighted with our 2 Grafton Stools. They are solidly built and very easily constructed. 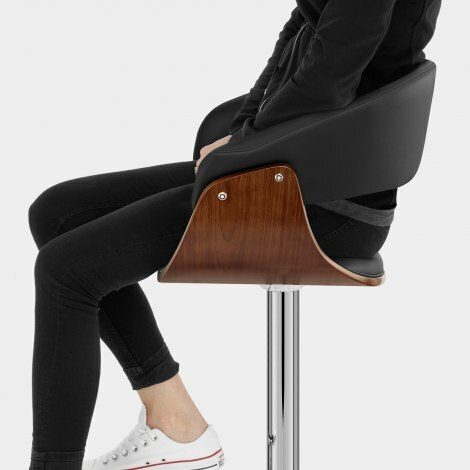 Supportive seating and easily adjusted height. Atlantic Shopping were excellent to deal with, combined with free next day delivery. We would certainly recommend this product and this company.